Buzz Lightyear, the ultimate hero from the smash hit Toy Story movies, is back as you've never seen him before! Now for the first time ever, be there as the world's bravest Space Ranger takes on the evil Emperor Zurg in an intergalactic struggle of epic proportions -- right in their own backyard: the Gamma Quadrant far, far away. This all-new feature-length animated saga includes a special introduction starring Woody, Jessie and Rex. Join them as they cheer for Buzz Lightyear (voiced by Tim Allen): hero, legend, movie star…and an action figure's action figure. DVD: Widescreen 1.78:1; audio English DD 5.1; subtitles none; closed-captioned; single side - single layer; 20 chapters; rated NR; 70 min. ; $29.99; street date 8/8/00. Supplements: Digital Comic Book; Star Command Trivia Game; Rogues' Gallery Game. To call Disney's direct-to-video (DTV) offerings "spotty" is probably too much praise. I've not experienced a lot of those films, but what I've seen has been crude and mediocre at best; movies like The Lion King II: Simba's Pride and An Extremely Goofy Movie have provided weak animation and little inspiration. Disney's most recent DTV affair, Buzz Lightyear of Star Command: The Adventure Begins certainly fails in the animation department. Unlike its inspirational predecessors - the two Toy Story films - the vast majority of Buzz does not use computer graphics. Nope, this is a traditionally-animated release, and one that uses exceptionally cheap and crude art at that; even compared to other Disney DTV films, this one looks stiff and lifeless. If any worse animation has ever escaped under the Disney nameplate, I've not seen it. Despite that flaw, I found Buzz to offer a generally fun and enjoyable experience. Essentially the film appears to be a pilot for an upcoming Saturday morning cartoon show, and it does a nice job of starting the series. The movie examines the exploits of the "real" Buzz Lightyear (as opposed to the toy version in the TS pictures) and adeptly introduces the new crew who will be an integral part of his adventures. Apparently just for this outing, Tim Allen returns to do the voice of Buzz, and his presence adds a lot of credibility to the project. (The DVD includes clips from the actual TV shows, and it's obvious someone else performs as Buzz there.) As usual, Allen provides the appropriate level of bluster and bravado as Buzz, and he helps make the project more successful. As does the remainder of the cast, a group filled with recognizable (though not terribly famous) names. We get two Seinfeld veterans among the crew, with Wayne Knight as Evil Emperor Zurg and Patrick Warburton as the Little Green Men; this seems odd, as I'd envision it to work in the opposite direction, but both are fine in their roles. Larry Miller's quite good as a robot, and Stephen Furst (Flounder from Animal House) does a nice job as aspiring space ranger Booster. It's a solid and professional group that adds to the quality of the production. The plot to Buzz is pretty typical space ranger type stuff, and there's nothing exceptionally special about the film, but some of that witty Toy Story spirit comes through in the production. No, the movie doesn't approach the level of those theatrical gems, but it certainly seems much stronger than the average Saturday morning tripe. Buzz Kept me entertained and involved for most of its running time, and considering the no-frills nature of much of the production, that's a pretty solid achievement. Note that some of the cast of Toy Story also reappear in Buzz. The film starts with a computer animated introduction that features TS characters Woody, Hamm, Rex, Sarge and Wheezy. Only the last three of those roles are performed by the original actors, however. Hanks does Woody, but it's not Tom Hanks; instead, we get his gotta-feel-like-a-failure-at-family-reunions brother Jim. The younger Hanks does a credible imitation of his radically more famous sibling; I briefly thought it actually was Tom, though the differences are pretty apparent. The other substitution seems odd, but not for the reasons you might expect. Andrew Stanton - who, like Joe "Wheezy" Ranft, mainly works in production at Pixar but has contributed some vocal work as well - takes over Hamm from John Ratzenberger. Nothing weird there, right? Correct - the strange part stems from the fact that Stanton did the voice of Zurg in TS2 but doesn't reprise that bit here. I can surmise the reasons for this, mainly stemming from a probably desire for a more experienced vocal talent to handle the role; after all, Zurg will now appear as a major character in a weekly TV show, not just as a bit part in a movie, so they may have wanted a more established name as the emperor. It still seemed weird to me, especially since Knight's interpretation of the voice so differs from Stanton's; at least Jim Hanks made his Woody sound like his brother's performance. 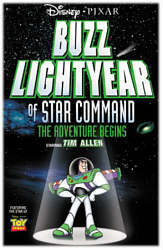 Buzz Lightyear of Star Command: The Adventure Begins appears in an aspect ratio of approximately 1.78:1 on this single-sided, single-layered DVD; the image has not been enhanced for 16X9 televisions. The movie looks pretty good overall, with most of its flaws attributable to the cheap quality of the production. The picture seems nicely crisp and accurately-defined for the most part, with some vague softness interfering during a few wider shots. I noticed no examples of moiré effects, but jagged edges were a minor nuisance at times; they appeared mainly when we saw the curved space helmets. Print flaws seemed non-existent, though the film looked vaguely gritty at times; again, I think that was just a result of the inexpensive animation, as much of the movie simply looks flat for reasons that don't appear associated to the transfer. Colors seemed slightly heavy at times, but for the most part they appeared nicely rendered, and the movie presents a wonderfully varied palette; especially appealing were the dark maroons of Zurg's planet. Black levels looked appropriately dark, and shadow detail was good; neither of the latter two issues were prominent in this cartoon, but both seemed perfectly fine. Ultimately, Buzz looked very good. The film's Dolby Digital 5.1 soundtrack also performed well, though not without some complications that seemed to result from the no-frills production. The soundfield seemed fairly broad but not as seamless as I'd like; I heard a fair amount of discrete audio but it appeared a little too "speaker-specific" at times and didn't blend tremendously well. The forward spectrum worked best, as it presented a decently smooth and active environment. The rears seemed neglected to a degree; for example, early in the film I heard isolated puffs and bumps, but nothing very involving. It's a good soundfield overall, but I thought it could have used a little more finesse. Audio quality seems pretty decent but with some similar concerns. Dialogue was natural and articulate, with no problems related to intelligibility. Effects are crisp and clean and lack signs of distortion, and the music seems clear and bright. The production features some fair low end, but I felt it lacked much of a punch. It's one of those "whole less than the sum of their parts" deals: although each component of the mix fails to include noticeable flaws for me to mention, the entire package seems without much impact. It's a good track but it could have been a little stronger. As could/should the DVD's supplements. It's the old bait and switch: originally Buzz was supposed to include an audio commentary from Toy Story characters Rex, Woody and the Little Green Men. Disappointingly, it's not here, and what we do find is pretty insubstantial. The DVD features two different trivia games. There's "Rogues' Gallery Game", which asks 20 questions about Buzz's different foes (10 enemies, two questions each). During the first "round", when you answer correctly, you get a brief biography of that villain, whereas the second set presents little TV clips for every right response. I thought this game was odd because it assumes knowledge of the upcoming TV show. Note that word "upcoming"; that means it ain't on the air yet. That means there's no way for any of us to have the slightest notion of these characters. Granted, it's usually not hard to figure out the answers, especially in the second round, and the game's very forgiving; if you reply incorrectly, it'll let you keep trying until you get it right. Still, I thought it was weird. More logical is the other quiz, the "Star Command Trivia Game". This piece is more typical of the other trivia contests included on Disney DVDs, as the 16-question match provides posers about the movie itself. As usual, they're pretty easy. Finally, the DVD includes a "Digital Comic Book". That's just another name and presentation for the standard "Read-Along Storybooks" on other Disney DVDs. Yes, the cartoons are shown in comic book style, and it's a new tale, not just a text rehash of the film - Buzz and Mira Nova have to rescue her home planet from Zurg - which makes it more interesting. But it's still something that gives kids the option of reading the text themselves or following along as the announcer decodes it for them. Regular readers of my Disney reviews will know that this is the space in which I discuss the much-loathed ads that run after you insert the DVD into the player. The DVD starts with the usual copyright warning, and then it launches immediately into an announcer with his usual "Coming soon to own on video and DVD..." line. We find ads for 102 Dalmatians, The Tigger Movie, Fantasia 2000 and Toy Story 2. I don't particularly mind these ads, but many others detest them. Some folks seemed to object to the simple capitalistic nature of the beasts - though few ever complained about promos found on Fox and Universal DVDs - but much of that sentiment appeared to stem from problems skipping the ads. On my Panasonic player, I could easily hit the "skip" button to get past them, but others related less success on some machines. Even for those (like me) who could skip the ads, some irritation appeared due to the nuisance. Personally, I don't think it's a big deal to hit "skip" five or six times, but others felt differently. As such, note that not only does Buzz let you skip the whole magilla by pressing the "menu" button on your remote - which had always been deactivated for the others - but it also actually tells us that; text at the bottom of the first screen relates the availability of this option. It doesn't eliminate the existence of these ads, but it's a step in the right direction. As with all of the Disney DVDs that feature these ads, masochists can also access those promos through the "Sneak peeks" selection on the main menu. Unlike most of those DVDs, however, this one includes a button called "More peeks". Press on that and you can see previews for a Buzz Lightyear videogame and for the upcoming TV show. It ain't much of an extra, but I thought I'd mention it. My biggest disappointment attached to Buzz Lightyear of Star Command: The Adventure Begins stems from the lack of extras, especially since I'd really looked forward to that audio commentary; its lack of existence makes this a much less appealing package. Nonetheless, the film itself was modestly enjoyable; the animation appeared very crude and stilted, but the vocal performances are solid and the story includes some clever and witty material. The DVD provides good but unexceptional picture and sound, though it features almost no substantial supplements. For Toy Story fans, Buzz Lightyear merits at least a rental.